In this recipe, almond paste provides a subtle, perfumy almond flavor that marries perfectly with the sweetness of the pears. You’ll find cans or tubes of almond paste in most grocery stores. Line a baking sheet with parchment. Combine the sugar and cinnamon in a small bowl. Unroll or unfold the puff pastry on a lightly floured surface. Pinch any creases together and then smooth them out with your fingertips. Cut the pastry sheet into four equal squares and transfer them to the lined baking sheet. Roll 1-1/2 tsp. of almond paste into a small ball, flatten it slightly with the palm of your hand, and put it in the center of one puff pastry square. Drop 1 tsp. of sour cream on top. Sprinkle about 1/2 Tbs. of the cinnamon sugar over the sour cream. 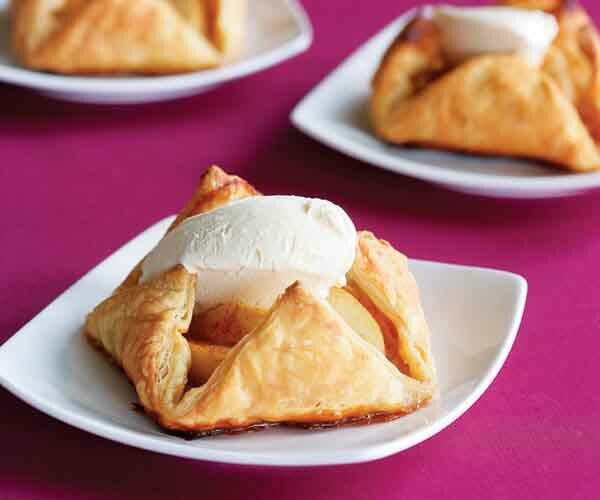 Arrange four pear wedges in the center of the puff pastry, two leaning away from the center one way and two leaning the other way. Sprinkle with another 1/2 Tbs. of the cinnamon sugar. Repeat with the remaining three puff pastry squares and filling ingredients—you won’t need all of the sliced pears. 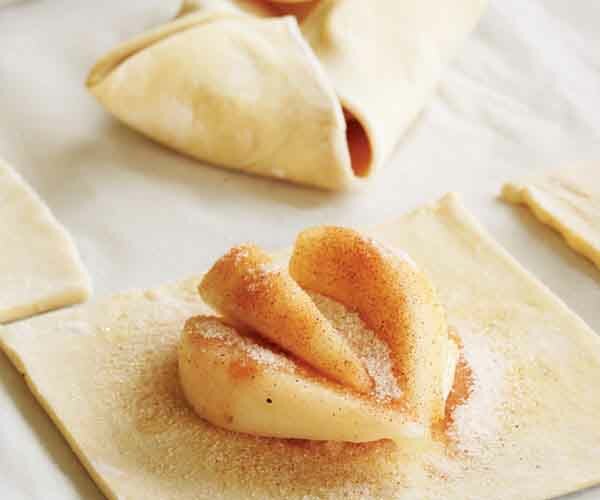 Fold the corners of the puff pastry over the pears until the tips are just touching but not overlapping and press the dough against the pears. (The tarts won’t look pretty now, but they’ll be beautiful once they bake and puff up.) Bake until puffed and golden brown on the edges, 22 to 27 minutes. Let cool. Any juices that leak onto the baking sheet will harden to a candy-like consistency, so break off and discard these bits before serving. 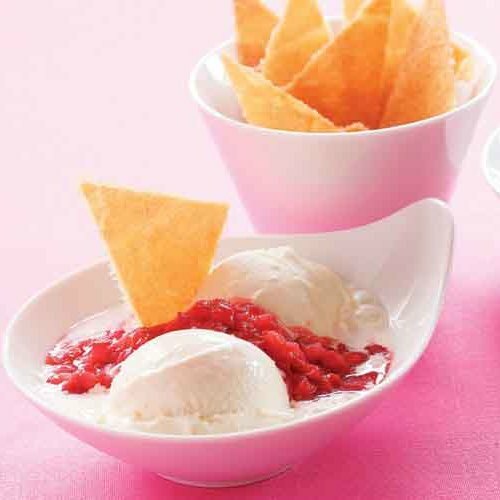 Serve topped with a scoop of vanilla ice cream, if you like. I made these tarts tonight for dinner guests. As the previous reviewer mentioned...the tarts opened up during the baking. I took them out of the oven (before they were finished baking) and put 4 toothpicks in each tart so as to keep the 4 points points from falling open. This seemed to work. In the end they were really good served with frozen vanilla yogurt. I will definitely make these again! I have tried this recipe a couple times now. Because it is fool proof and looks and tastes great, this is a good one to keep in mind when entertaining guests. Cutting pears wedges across versus lengthways, especially if the pear is longer makes it easier to shape the tarts. Also, both times I tried this recipe, the tarts opened up almost completely during baking. But if left to set a couple minutes after taking them out of the oven, then the sides can be folded back up and they hold.